What a way to start the New Year! Our good friend and fellow MVP has a new book out called Microsoft Dynamics GP2010 Implementation. Victoria is extremely knowledgeable about Dynamics GP and has been a GP MVP for longer than I've even known what an MVP is. She has taken her vast knowledge about GP and used it to create a step-by-step guide to implementing GP2010. I'm going to read the book in the next couple of weeks and post a review here on the blog but I wanted to give you all advance notice that the book is available here - https://www.packtpub.com/microsoft-dynamics-gp-2010-implementation/book. 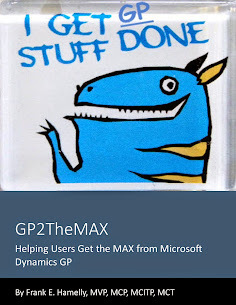 I'm really looking forward to reading the guide and whether you're getting ready to implement GP2010 or just want to learn more about it, I'm sure this will be a must-have for your GP library.